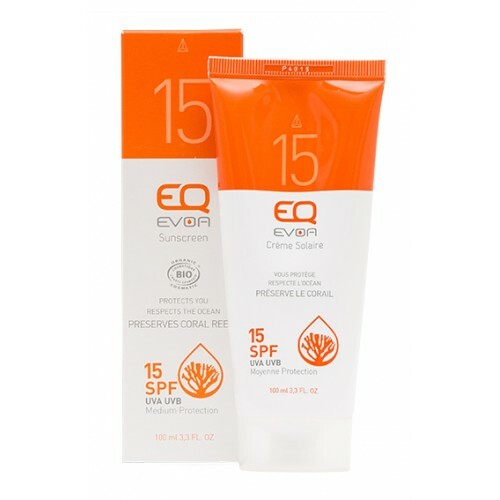 Ideal eco-friendly sun protection for skin which already has a base-tan or which is not prone to sunburn. Aqua (water), Dicaprylyl carbonate, Titanium dioxide, Glycerin*, Prunus armeniaca kernel oil* (apricot), Polyglyceryl-3 disostearate, Carthamus tinctorius seed oil* (safflower), Cera alba (beeswax), Copernicia cerifera cera* (carnauba wax), Polyglyceryl-2 dipolyhydroxystearate, Olea europaea fruit oil* (olive), Sodium chloride, Aluminium hydroxide, Stearic acid, Benzyl alcohol, Silica, Jojoba esters, Parfum, Tocopherol, Dehydroacetic acid, Mica, CI 77491. *Ingredients resulting from organic farming.